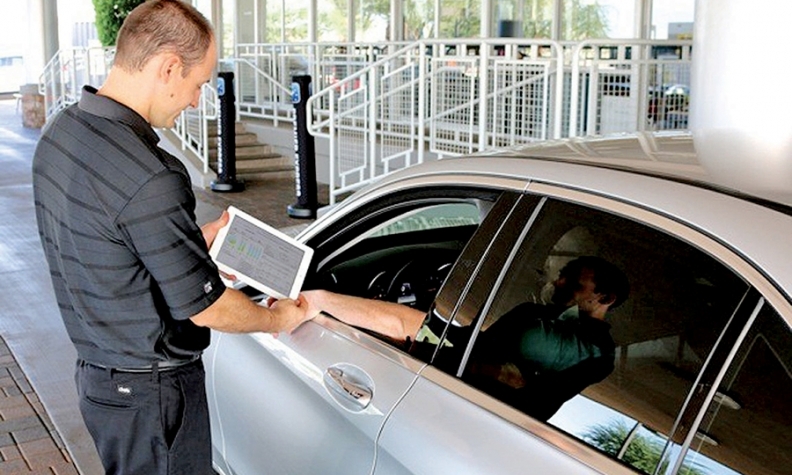 Eric Bobesku, a service adviser at Schumacher European, uses an iPad to assist a customer. The dealership makes customer service a priority. Schumacher European, a Mercedes-Benz dealership in Phoenix, is a big store in a major city -- one of the largest stores on this year's list of the Best Dealerships To Work For. How does it avoid the impersonality of a large company, which can leave employees feeling like management is distant and unengaged? By striving for the mentality of a small-town store. Each of the dealership's 162 employees is expected to make eye contact and greet any customer or fellow employee who comes within 10 feet, said General Manager Kevin Steele. Most employee meetings are scheduled around lunchtime so participants can eat and relax, Steele said. Owner Werner Schumacher has tried mightily to maintain wages and benefits, Steele said, going so far as to continue offering dependent health-care insurance when many stores in the market don't. And one day Schumacher raised wages for valets, car washers and entry-level employees from $8.50 and $9 an hour to $11 and $12 an hour. "Some of these people were driving 45 minutes to work and the team just felt they weren't making enough money," he said. Schumacher's philosophy is that happy employees lead to a better customer experience, Steele said. "We try to hire people who are friendly and engaging with customers," he said. Schumacher sells about 210 new and used vehicles per month. The award-winning store also sells Sprinter and is an AMG center, meaning that its employees get special training to sell and service Mercedes' line of performance vehicles. Steele said he knew he had found the right place to work 21 years ago when he interviewed for a job with Schumacher. The owner made it clear that problems, whether internal or with customers, were to be handled immediately -- "not tomorrow, not a week from now," he said. That attention to service, Steele said, is reflected in customer-review ratings of four stars-plus (out of five) on such major review sites as Google, Yelp and DealerRater. All employees receive regular training, Steele said. And the store tries to do a little extra for compensation. For example, during the recession, the store suspended its 401(k) match for nine months before restoring it completely, he said. And employees receive the technological tools and training to do their jobs. Three years ago, service advisers were provided iPhones so they could take pictures and text updates to customers, Steele said. Today, all sales advisers have iPads to assist customers, he said. Many Mercedes customers come to the brand because of the vehicle technology, and Schumacher European expects its salespeople to be tech savvy, Steele said. "Mercedes-Benz is in the technology business," he said. "We need to be, too."